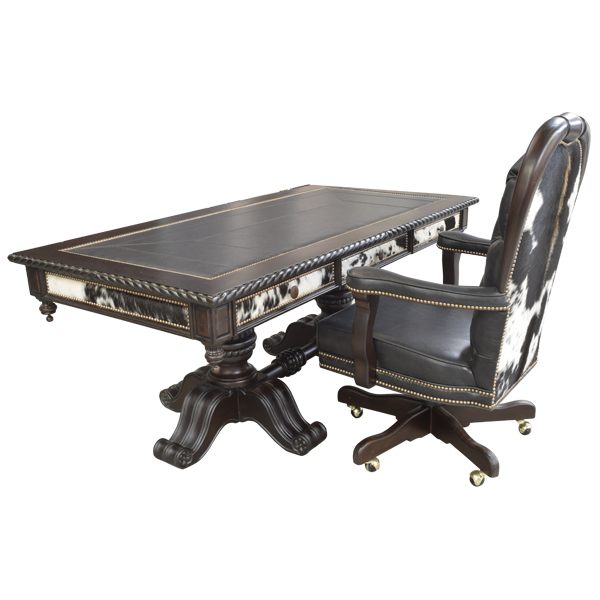 With its real cowhide details and dramatic, dark finish, this handcrafted, Western style desk is essential to your Western décor. The front of the desk has three, rectangular drawers, and each drawer is covered with patterned, real cowhide and embellished with gilt nails. Each drawer has a hand forged, iron, pull handle in its center. 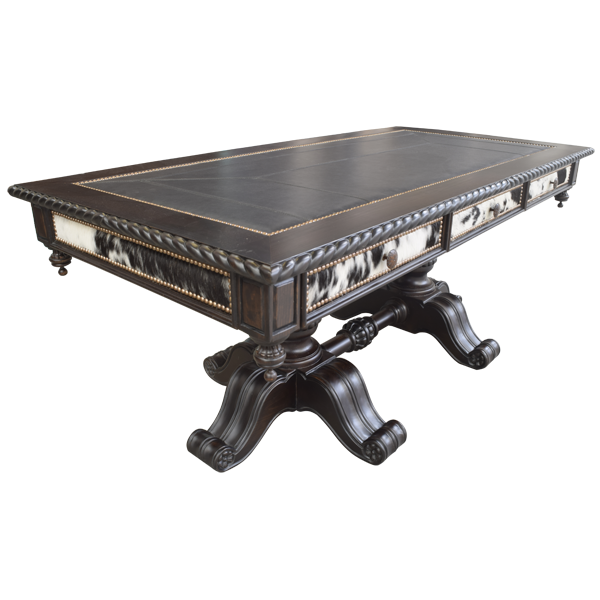 The top of the desk has an inner rectangular design covered with black, full grain leather. The leather is double stitched together for extra strength and durability. 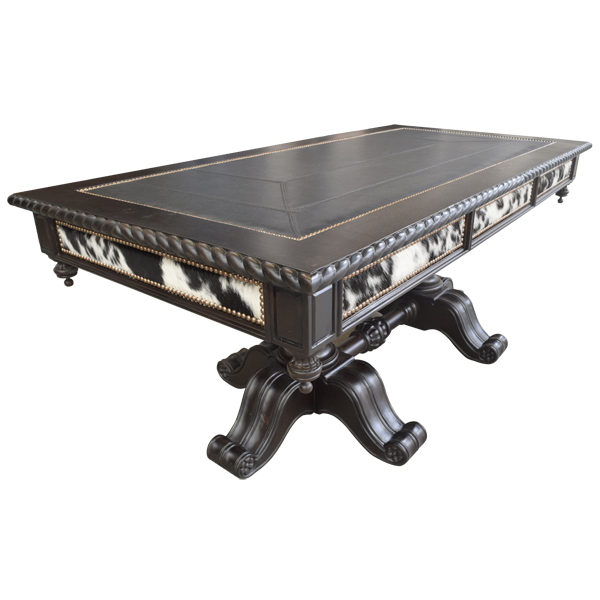 The sides of the top of the desk are covered with patterned, real cowhide, and all of the leather is hand tacked to the solid wood frame with lovely, gilt nails. The top rim is enhanced with a hand carved, twist rope design. The corners of the desk have a hand carved, ranch brand, and under each corner is a sculpted, solid wood, adornment. 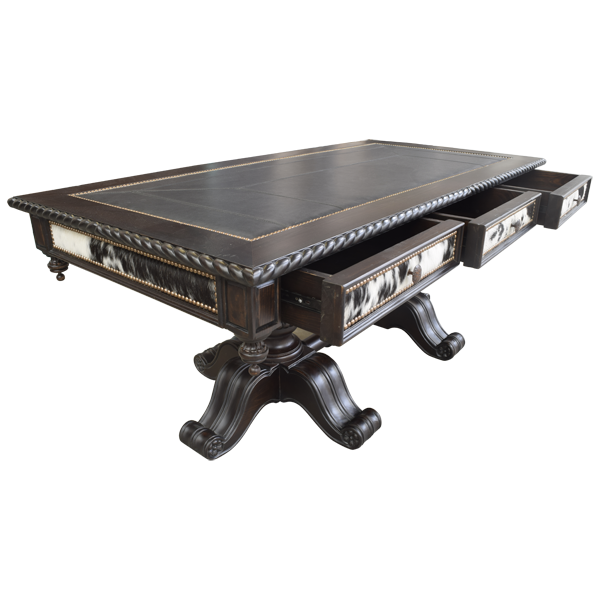 The desk is supported by two, luxurious, hand turned pedestals, and each pedestals has three, curved, solid wood feet with hand carved, fluted designs. The pedestals are connected by a beautiful, hand turned crossbar. The desk is made with the best, sustainable, solid wood available. It is 100% customizable.